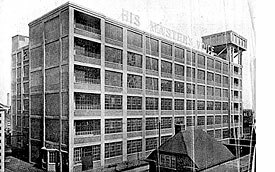 The first factory project in which we know Owen Williams had a hand, designed while he was working for the UK subsidiary of the American-owned Trussed Concrete Steel Company (known as Truscon). Williams later claimed to have produced the design single-handed. Originally used as the machine shop, it is a typically severe, functional concrete structure, six storeys high and 12 bays long, and of post and beam construction. It stands at the centre of a complex of buildings between the canal and railway. A water tower stands high above the building at one end. The building has an exposed concrete frame an brick infill walls to cill height, with metal framed windows above. The end walls are exposed concrete, inset 6in to allow the frame to be expressed.